PHOENIX — More than 700 old life jackets were replaced with new ones during life jacket exchange events held throughout Arizona this year. 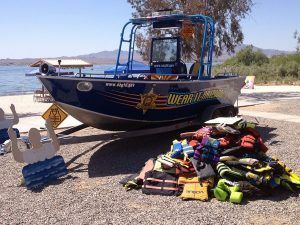 The Arizona Game and Fish Department’s Boating Safety Education program worked with volunteers and partners at Lake Havasu, Lake Mohave, Lake Pleasant, Lake Powell, Canyon Lake and Saguaro Lake during eight events to swap 734 old or incorrectly sized life jackets for brand new, fully functioning life jackets in the person’s appropriate size. A life jacket should fit snug. Have a child lift his or her arms overhead while you lift up on the life jacket by the shoulder straps; if the jacket rides up above the ear lobes, it is too big. Adults can self-check by hooking their thumbs under the shoulder straps and pulling up; if the jacket rides up over their ear lobes, it is too big. You should be able to fit your fingers in the back of the life jacket on a child. If you can’t, then it’s likely too tight. The exchange events, which began in 2008, aim to encourage everyone to stay safe out on the water by always wearing a life jacket — whether on a boat, paddleboard, kayak or canoe. All boats in Arizona must have a life jacket aboard for every passenger, and those 12 years old and younger must wear a life jacket at all times, under state law. The Arizona Game and Fish Department partnered with the U.S. Coast Guard Auxiliary, Mohave County Sheriff’s Office, Lake Havasu City Police Department and numerous volunteers to make the exchanges possible. The new life jackets were purchased with U.S. Coast Guard funding.